Welding helmets are an essential and critical accessory of any welder’s Personal Protective Equipment. Helmets should be worn throughout the welding process to protect the eyes and face from the harmful radioactive lights and heat produced. All helmets should conform to ANSI Z87-2003 standards. Miller produces some of the best welding helmets in the industry. It offers a wide collection of helmets to suit various welding applications and personal preference. Miller Welding Helmet, Shade 3 And 8-12 5-1/5 Sq. In. True Blue Warranty $ Check Amazon for Best Price! 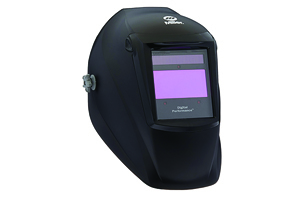 Miller Welding Helmet Digital Performance 7.22 Sq. In True Blue Warranty $$ Check Amazon for Best Price! Miller Welding Helmet Digital Elite 7.22 Sq. In True Blue Warranty $$$ Check Amazon for Best Price! Miller Welding Helmet Infinity Series Lithium 5A 13.4 Sq. In. True Blue Warranty $$$ Check Amazon for Best Price! Miller Welding Helmet, Silver Titanium 9400 9.22 Sq. In. Viewing Area True Blue Warranty $$$ Check Amazon for Best Price! Different welding applications require different helmets. It is important to choose the right helmet for the type of welding one is working upon. Miller’s helmets have basically the same features, but the level of technology used brings the structural difference and consequently the difference in their efficiency. The helmets may have passive or auto-darkening filters, fixed or variable shades, with two, three or more sensors. Some are X-mode enabled and have electromagnetic arc sensors to protect against the interference of sunlight while working on outdoor projects, or on low-amperage TIG, pipes, curves and hidden areas. Other helmets have Info Track which features arc time, timer functions, digital clock and multi-language help menu. In the section below, the difference and descriptive features of some of Miller’s classic and digital series helmets are discussed. Check Amazon for Best Price! This auto darkening variable shades helmet features the classic series lens technology powered by a replaceable battery that is solar assisted. It has a battery life of 2000h. The classic series controls are dial-operated, and the helmet does not support the grind mode of operation. It has TIG rating of 20 Amperes, and it is ideal for Do-It-Yourself projects and light industrial duties. 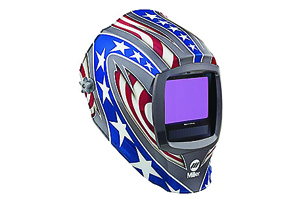 The helmet uses classic series lens technology that has a good optical clarity and improves visibility during welding. It has an auto-darkening filter that allows variable shades, with dark shades ranging from 8 to 12 and a light shade of 3. The welder can, therefore, adjust it according to the light intensity. It has two independent arc sensors that support 1/10000 seconds switching speed. This helmet has a viewing area 5-1/5 sq. in. The item is classified as lightweight at 2 pounds. The headgear material used is durable nylon. It comes with Miller's blue true warranty. The helmet is comfortable and highly adjustable to fit various welders. This digital performance helmet series offers 3 modes of digital versatility for intense welding and cutting applications. This helmet has variable shades supporting the grind, cut and weld modes of operation. Unlike the classic series helmet, this helmet has digital controls which allow the welder to easily adjust the modes of operation and settings. It also features lower amperage rating at 5A, has 3 arc sensors with a switching speed of 1/20000 seconds, and solar assisted lithium batteries with a life of 3000h. The digital lens used offers a clear view of the weld puddle. The helmet has a 7.22 square inch viewing area. It weighs around 2.85 pounds. The headgear is made from durable nylon, and it comes with a 3year warranty period. The helmet has been redesigned to feature additional adjustability settings, for the welders’ comfort and ergonomic needs. 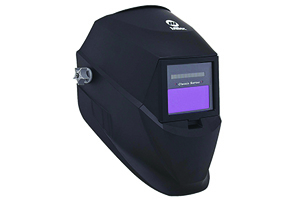 The Miller Black Digital Elite auto darkening welding helmet is an improved version of the digital performance series. This digital elite helmet has an all new digital lens and operates the grind, cut, weld and Miller’s X-modes. The digitals controls have large push buttons making it easier for the welder to use. 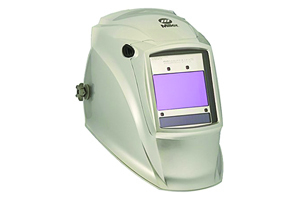 This helmet has a new improved digital lens, and with four arc sensors and a larger viewing area, the welder can clearly work in obstructed or agile areas. It has a viewing area of 9.22 square inches. It is light and weighs 1.1 pounds. The material made from nylon which is considered durable. This item has also been redesigned to feature additional adjustability settings for custom fit & comfort. The Miller 271330 Digital Infinity helmet features the largest viewing area of any auto darkening welding helmets in the industry. The Digital Infinity lens has shades 3, 5, 5-8 and 8-13, and the four operating modes. Another unique feature is the Info Track use which has arc time tracking, time and timer functions and a multi-language menu. 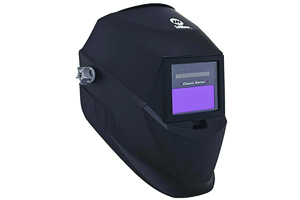 This helmet has an excellent optical clarity, and with largest lens size, the welder can efficiently work from all angles increasing productivity. It has a 13.4 sq. in. viewing area. The helmet is lightweight at 0.5 pounds. The ratchet headgear is made from durable nylon and a two=year warranty. The headgear has been redesigned with an oversized comfort cushion, and several adjustable points, additional settings, and improved stability and balance. Miller Titanium 9400 welding helmet has been improved and fitted with a new digital auto-darkening lens. It has lens shades of 3,5,5-8 and 8-13 with the four operating modes. It also has the Miller's InfoTrack arc timer and digital clock, and an external grind control to allow a switch to grind mode with just a push of the large button. It also features shock-absorbing gasket that is very strong and protects the lens from high- impact falls. This digital titanium helmet has an aluminum and silver shield to protect and reflect heat. It is, therefore, ideal for heat intensity and demanding industrial welding applications, offering the convenience and technology needed for professional welding. With the new digital auto-darkening lenses, titanium helmet offers excellent optical quality. It has a 9.22 square inches viewing area. The item is considered lightweight at 1.3 pounds. It is made from high quality durable nylon. The headgear is highly adjustable to fit the welder’s preference and comfort.